To put it mildly, Keller Creek has been transformed. 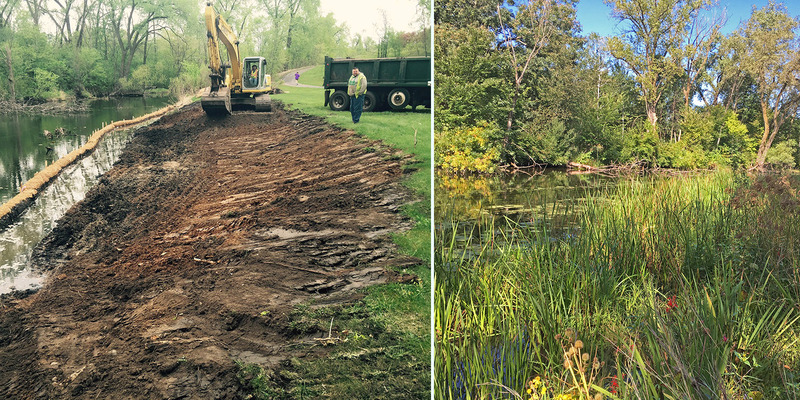 Four years have gone by since restoration work began on this important wildlife and recreational corridor located in the heart of the Lake Phalen Chain. 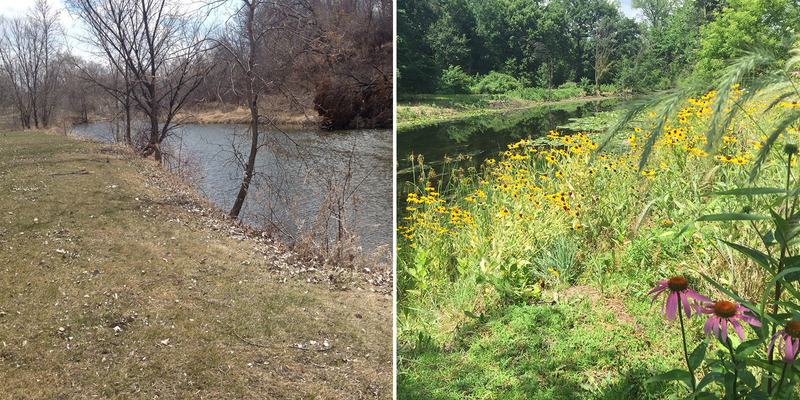 More than 100 species of Minnesota native plants now thrive along nearly a mile of the creek, thanks to the tireless efforts of District staff, partner organizations and volunteers. 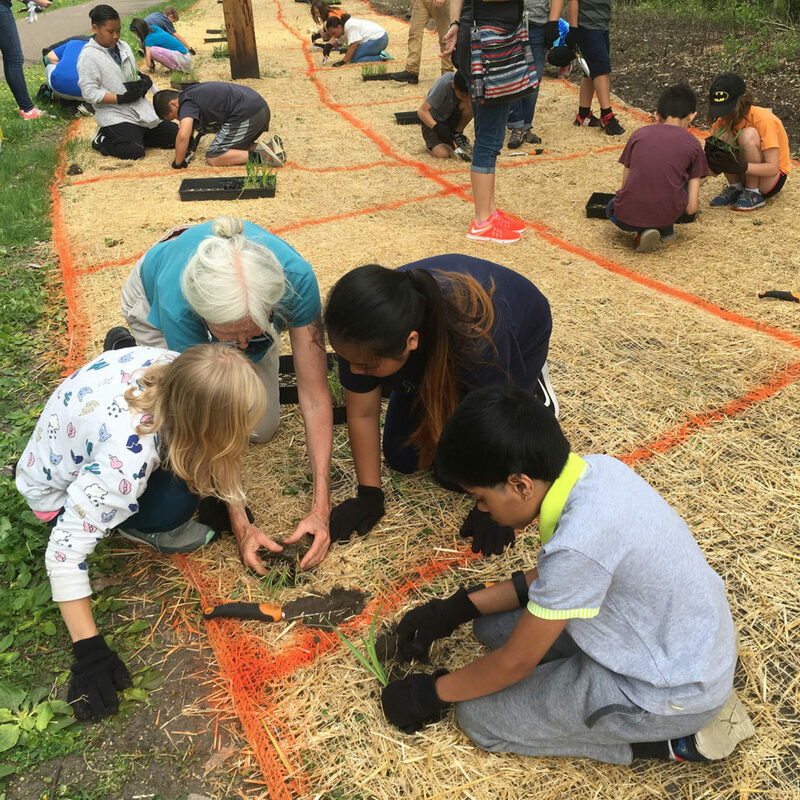 In many ways, the project was a grassroots operation as school groups assisted with planting, Conservation Corps Youth Outdoors crews helped remove invasive plants, and both Ramsey County and the City of Saint Paul donated significant in-kind labor. 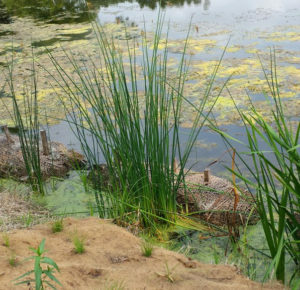 About half of project costs were funded by a grant from the Minnesota DNR’s Shoreland Habitat Restoration Grant Program. Prior to modern development, Keller Creek was a marshy wetland flowing from Gervais Lake southward to Lake Phalen. Traveled by the Dakota people, it had a wide flood plain gradually transitioning from emergent plants to wet meadow habitat. In the early 1900’s, the creek was dredged to allow for boat navigation, drastically altering the ecosystem. Dredged sediment was likely dumped along the banks, smothering the wetland edge. Development of Phalen Park eventually saw most native plants replaced with turf grass. Over the years, invasive species moved in with buckthorn, Canada thistle, spotted knapweed, burdock and reed canary grass dominating the water’s edge. Erosion created steep cut banks with soil washing into the stream, and emergent vegetation was virtually non-existent. High-quality emergent vegetation is now established along much of the creek after being absent for 100 years. The project to restore Keller Creek launched in 2015, 100 years after the creek had been dredged. 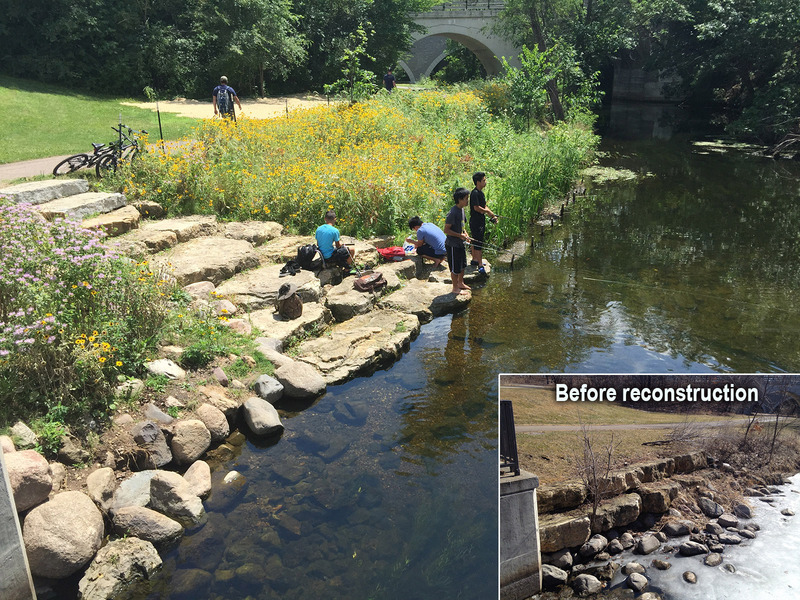 With large areas of natural habitat already restored nearby at Lake Phalen, Keller Lake and Keller Golf Course, the creek project essentially linked these restorations together. Wading birds like herons and egrets have also taken notice, patrolling the reeds and plucking out young fish. The creek’s diverse mix of native wildflowers now attracts many different pollinating insects, including strong numbers of monarchs this past season. Restoring Keller Creek was a major undertaking, both in terms of site preparation and the planting itself. The project was divided into four phases with different sections of the creek restored each year. Purging each area of invasive species was the first challenge, accomplished by District and Saint Paul staff, interns, Conservation Corps and labor crews from Ramsey County Corrections. The work required pulling weeds, treating thick patches of reed canary grass with herbicide and cutting down truckloads of buckthorn. Corrections grew the majority of the native plants for the project, and their crews were a major help with buckthorn and tree removal, hauling, grading, and erosion control. Stretches of shoreline were excavated to create a more gradual slope down to the water where emergent and wet meadow plants could take hold. Excavating the slope down to the water (left) restored gradual transition zones for emergent and wet meadow plants to grow along the creek (right). Brush bundles staked near the banks helped protect young emergent plants from muskrat feeding. In the creek, the team staked down bundles of cut buckthorn wrapped in coconut fiber. These bundles, nicknamed “biorritos” by staff, provided erosion control and protection for newly planted emergent vegetation. The creek is home to a large population of muskrat, which eat the young plants. However, the woody material seems to discourage muskrat feeding, giving the plants a chance to grow and establish. In most cases, emergent vegetation was planted behind the bundles on the shore side. While this strategy worked well overall, the muskrats prevailed in a few areas, prompting Bartodziej to take extra precautions this year. “For this last effort, we planted through the brush bundles, and that gave those plants some added protection from muskrat feeding,” he said. According to Bartodziej, bringing back this emergent habitat was one of the greatest challenges and most rewarding aspects of the project. Another notable accomplishment was reconstructing the portage access around the Keller Creek weir using limestone slabs donated by the City of Saint Paul. Not only does the improved portage help paddlers get between Lake Phalen and Keller Lake, the spot has become a popular shore fishing access as well. The reconstructed portage at the Keller Creek Weir is a favorite fishing spot for many park visitors. In May 2018, Weaver Elementary students planted an upland area adjacent to Keller Creek during the final phase of the restoration. Each spring during the restoration, Education Specialist Sage Passi coordinated classroom learning sessions and planting days on the creek with local schools such as Roseville Area Middle School, Farnsworth Aerospace Academy and American Indian Magnet School, to name a few. , Fifteen classrooms and hundreds of students annually learned about Keller Creek’s history and ecology before trying their hand at planting. 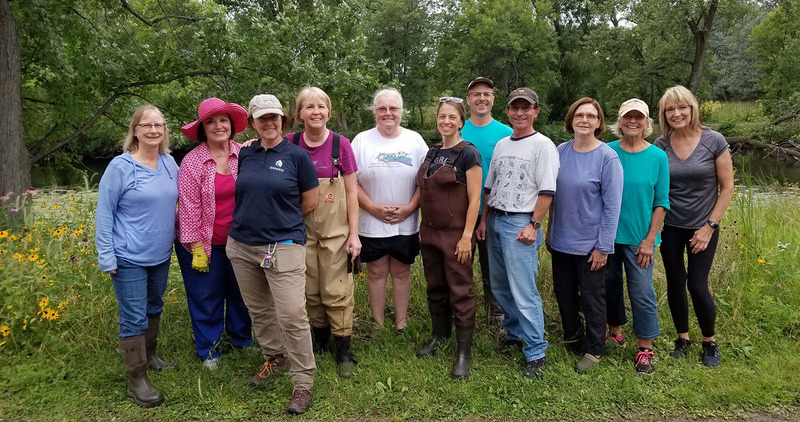 With instruction from Ramsey County Master Gardeners, District staff and interns, the students successfully planted thousands of native seedlings that are now maturing along Keller Creek. 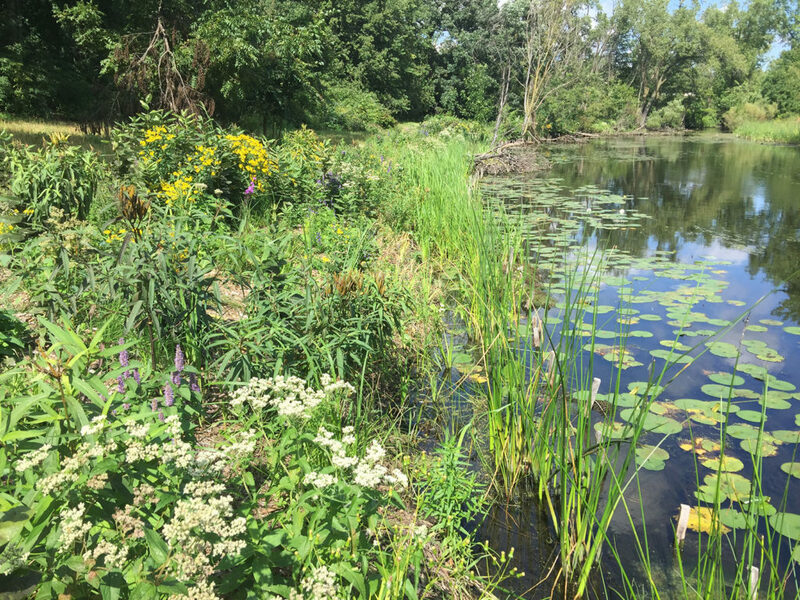 In August, members of our Citizen Advisory Committee and Landscape Ecology Awards Program (LEAP) Team waded the eastern banks of the creek to plant emergent bulrush and bur-reed. It was a fitting way to mark the end of a project that has benefited so much from the hard work of enthusiastic volunteers. Looking ahead, District staff will maintain the restoration through prescribed burning, spot treating invasive plants and monitoring banks for erosion. The goal is to ensure this important native habitat, missing from Keller Creek for a century, is here to stay. Members of our Citizen Advisory Committee and LEAP team helped to wrap up the Keller Creek project in August. L-R: Karen Wold, Katie Keefer, Simba Blood, Dana Larsen-Ramsay, Jill Danner, Carrie Magnuson, Mark Gernes, Scott Ramsay, Roxanne Hanley, Gail Acosta and Anita Jader. Not pictured: Bill Bartodziej. Photo courtesy of Anita Jader.